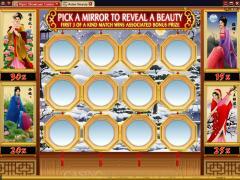 Asian Beauty from Microgaming reflects the characteristic ornate styling of Oriental themed slot games. The introductory clip is interesting. It shows the creation of a Japanese style sketch in black and white of the four Asian Beauties. Once the sketch is completed it gets instantly colored and shows the four ladies within a Japanese courtyard with a winter scene outside. 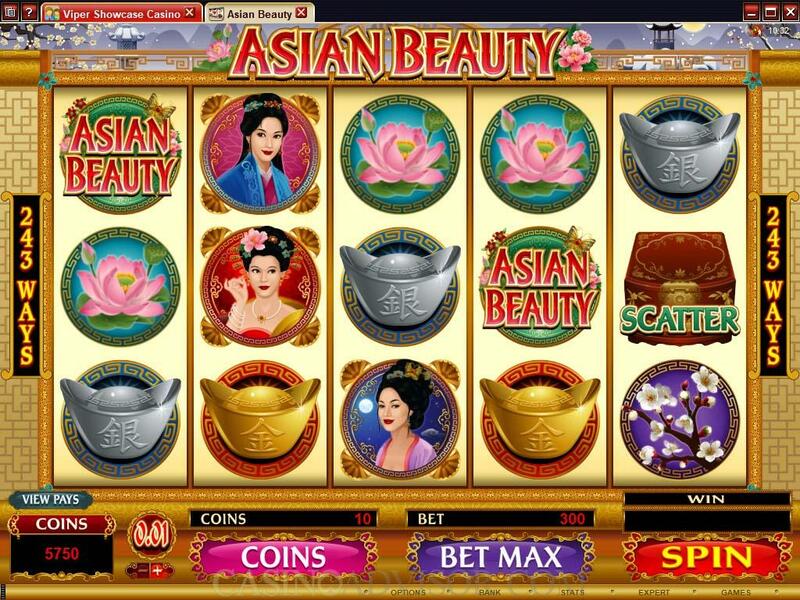 The animations in the Asian Beauty slot game are subtle, but in keeping with the theme. The frames around the four Asian Beauties disappear and the ladies engage in some graceful movements. The music has a classical touch. However, the big wins are celebrated with louder music and a shower of coins and flowers. 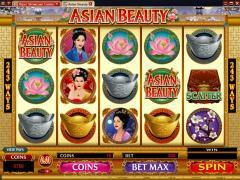 Asian Beauty is a 243 ways to win slot game. This means that like symbols appearing left to right on any position on the reels constitute a winning combination. The slot game accepts the following coin denominations: 0.01, 0.02, 0.05, 0.10, 0.20, 0.25 and 0.50. The players can wager up to 10 coins per line. The total bet is fixed at 30 times the line bet. The total bet is used for calculating the scatter payouts and the payouts in the bonus game on the second screen. 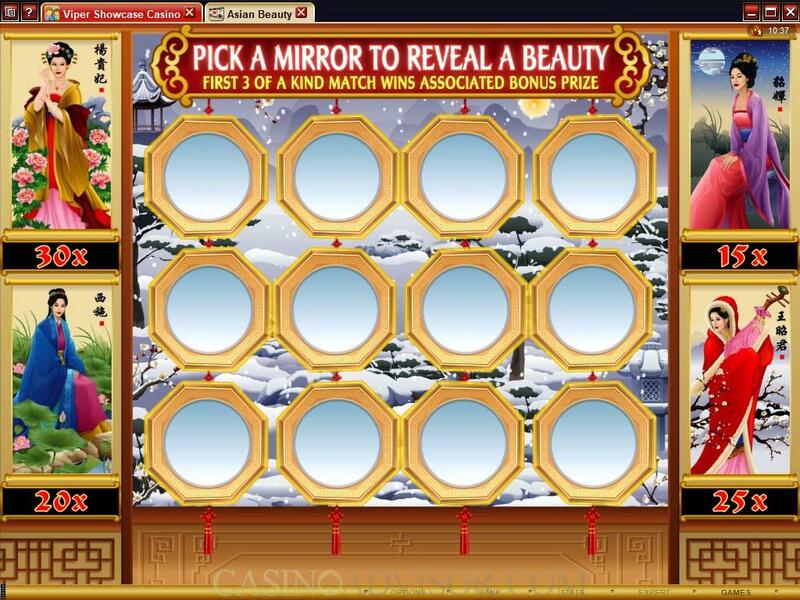 The highlight of the Asian Beauty slot game is the Mirror Bonus game on the second screen. This game is awarded randomly without the need for hitting a combination of symbols on the reels. 12 Japanese mirrors descend through the central part of the screen. On each side of the mirrors two Asian Beauties are displayed. Each beauty is assigned a multiplier. The player keeps clicking the mirrors of his choice one after another. One of the Asian Beauties is revealed in each mirror. When three images of the same Asian Beauty appear, the bonus game ends and the player’s total bet is multiplied by the multiplier associated with that beauty. A player can win a maximum of 9000 coins during the Mirror Bonus game. The Mirror Bonus game cannot be awarded during the free spins. In the normal spins if the free spins and the Mirror Bonus are awarded simultaneously, then the Mirror Bonus will be played first. Interested in reading more detailed information about Asian Beauty? If so Click Here for more details.